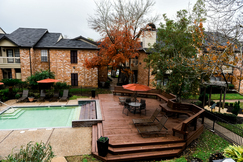 Hidden among towering trees and rich, garden-style landscaping, Green Tree Place raises your expectations for renovated apartment living near Houston’s Energy Corridor. Redesigned with upscale features, each pet-friendly floor plan creates a quiet haven in the midst of the city. Along with contemporary amenities throughout the community, Green Tree Place offers a convenient location near work, school and entertainment. Choose from the selection of renovated one and two bedroom floor plans. Whether you’re entertaining guests or appreciating the peace and quiet, each apartment welcomes you into a cozy environment. Reflecting a soft glow off the wood-style flooring, the fireplace crackles in the living room while you prepare dinner. Stainless steel appliances and granite-style countertops help you cook and clean efficiently. Convenience extends beyond the kitchen thanks to the walk-in closet and private balcony in every home. 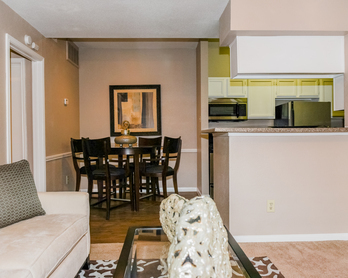 Within the gates of Green Tree Place, modern amenities fill your free time with entertainment. Stay in shape with a state-of-the-art fitness center, a resort-style pool and a walking trail, lined by the pristine landscaping. Located off Highway 6, residents are a short drive from major employers, schools and more. Contact a friendly Green Tree Place leasing agent for more information.